Okay, running a bit late this week but I decided to go with Gamma World. Gamma World is an interesting subject, in that it’s very niche, and that to enjoy it you need to accept some of its odd, over-the-top nature. People generally “get” it, or they don’t. At this point, there have been seven separate editions, the last of which was an odd combination of RPG and card game that didn’t really go anywhere. At its heart, Gamma World is, effectively, post apocalyptic science fantasy. We’re talking a world with malfunctioning robots, ultra-tech weapons to be salvaged, mutated talking animals, and comic book radiation. Think Planet of the Apes, Jack Kirby’s Kamandi, The Herculoids, or Thundarr the Barbarian. The first edition was, mostly inspired by Planet of the Apes, and Sterling Lanier’s Hiero books. With second edition, it’s clear that someone had been reading the Robert Adams Horseclans books. There was an edition for d20, published by White Wolf… that is the only edition I do not own. There was an editorial decision to make a game that was more realistic… radiation doesn’t work that way after all, and much of the gonzo craziness was left out. 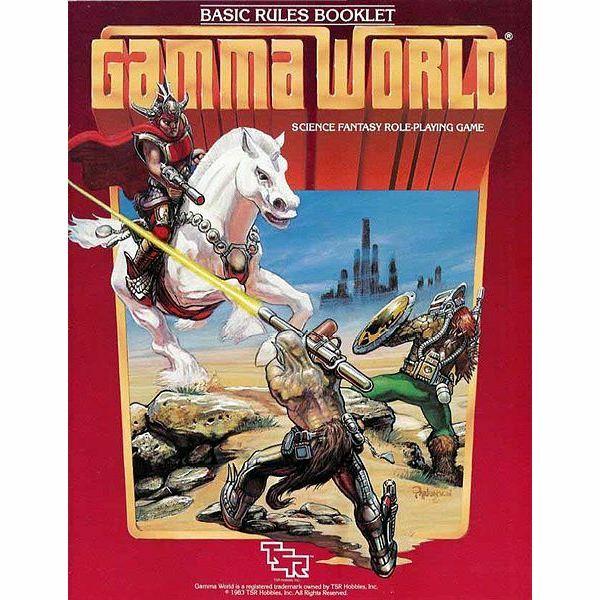 I’m sure it was a great game, but it was Gamma World in name only. There are some other games that fall into the same space, the primary and most successful of which would be Palladium’s Rifts, which embraced the spirit of Gamma World more than any other, I think. Character creation is fairly straightforward. I’ve gone with 2e primarily because character gen is actually organized and easy to follow. There are six stats, Mental Strength (MS), Intelligence (IN), Dexterity (DX), Physical Strength (PS), Charisma (CH), and Constitution (CN). The order of those stats are from the character sheet… NOT the order the book lists them in. I will follow the character sheet order. All stats are generated with 4d6, generally drop lowest, but Pure Strain Humans have some special rules. There are no character classes, but there are three ‘races;’ Pure Strain Human, Humanoid, and Mutated Animals. PSH are Humans that, somehow, have not been exposed to the various mutagenic dangers of the setting. Humanoids are mutated humans with strange powers, and Mutated Animals are anthropomorphic animals, possibly with strange powers as well. MS 16, IN 13, DX 17, PS 13, CH 11, CN 11. That’s actually a fairly impressive set of rolls, definitely above average. Hit point are generated with a number of d6 equal to your Constitution, or d8 for Pure Strain Humans. I end up with 35 hit points. If you are not a PSH, you then roll a d4 twice to determine how many physical and mental mutations you have. This character will have one physical mutation, and two mental mutations. You then roll percentiles + either your CN for physical mutations, or your IN for mental mutations. And that’s about it… as I said before, there are no classes, nor are there levels. Instead you track your status within your tribe or the world as a whole. Gamma World 1e, 4e, the d20 6e version, and the card based 7e are all available in PDF format through DriveThruRPG.